The Office@Hand Softphone is a free downloadable software application. Just log in to your online account and download the compatible Softphone for your computer. You can configure the Forwarding Rules in your online account to be notified of incoming calls to your Office@Hand number. 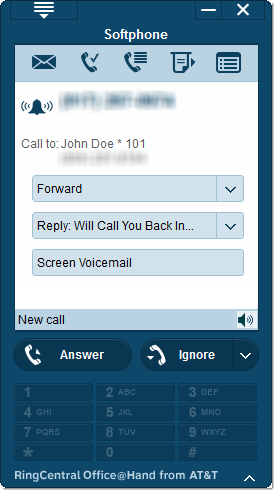 When receiving an incoming call, the software will pop-up and display the Caller ID of your caller and provide four call management options that include Answering the call on your PC, Reply, Forward to another number, Ignore or Send to Voicemail (and listen in). If you do not respond to the Softphone, Office@Hand will attempt to locate you through your call forwarding settings, or if none, send your caller to your voicemail. NOTE: If your call forwarding options are configured to forward calls, Office@Hand will only notify you of incoming calls and new messages through the Softphone if you have turned On the Notify my Softphone. In addition to the notification functionality of the software, you also have access to your Messages and Softphone Call Logs. If enabled (Menu > Options > Synchronize), the messages from your online account will automatically synchronize with your Softphone software. You can listen to voice messages, open faxes, and permanently save them without ever having to access your online account. Any changes you make through your Softphone Inbox will automatically update your online account, and vice versa. This software is provided for your convenience and it is not required that you use this software to monitor your incoming calls or manage your messages. When not using the software or whilst off-line, your Office@Hand number will still function per your set up in your Answering Options configuration. IMPORTANT: You need to have a DigitalLine associated to the Office@Hand Softphone to have incoming and outbound calling capabilities including 911. The Office@Hand Softphone does not support 9-1-1 calling without a DigitalLine. You need to check and select your Office Suite version if you are using a Windows computer. However for Mac users, all you need to do is download the OS X version. For Office Suite 2007 or lower, please select Download for 32-bit MS Office. 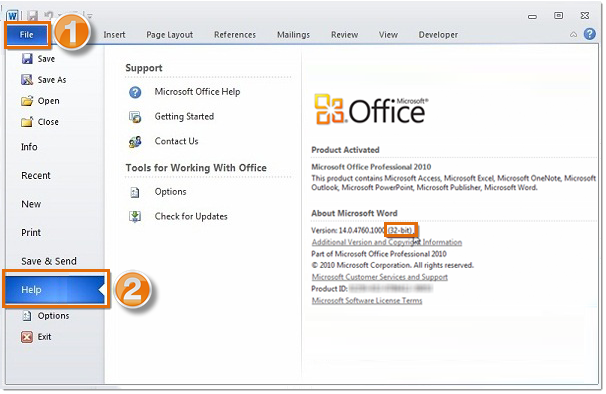 For Office Suite 2010, open any Office application. In this example, we’re using Word 2010, but it works the same in the other office apps. Open the File menu, and then select Help. On the right side, you’ll see whether the version is 32-bit or 64-bit. 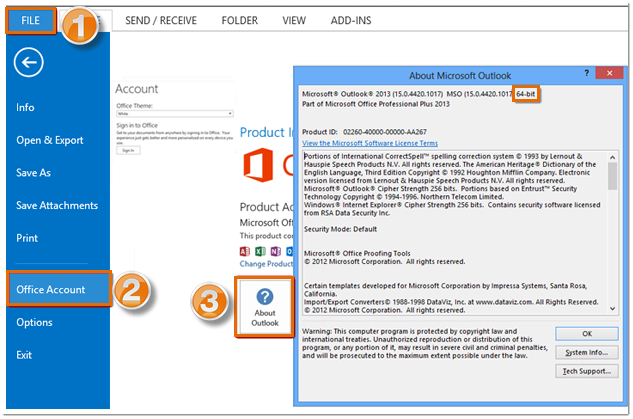 For Office Suite 2013, open any Office application. Let’s use Outlook 2013 as an example. Open the File menu, and then select Office Account. On the right side, click About Outlook, you’ll see whether the version is 32-bit or 64-bit. If you’re running the 32-bit version, you’ll need to download the 32-bit version of Softphone. If you have the 64-bit version of Office, you’ll want to select 64-bit version of Softphone. 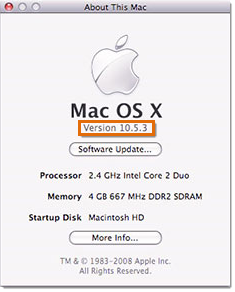 Follow these two easy steps to determine which version of the operating system is installed on your Mac. The resulting window shows your operating system version. NOTE: In this example, you are using Mac OS X 10.5.3. You may encounter a scenario wherein your Office@Hand Softphone suddenly malfunctions or hangs. This is maybe because you’re still using an old version of the Softphone. You may need to download an updated version available for free online.